Merged paths view is a tool for examining how objects are retained. It is especially useful for analyzing objects of classes with a great number of instances, such as int, java.lang.String etc. Merged paths is similar to Paths from GC roots; however, it does not show paths through individual objects, but paths from multiple objects grouped by class. For example, see the picture below. 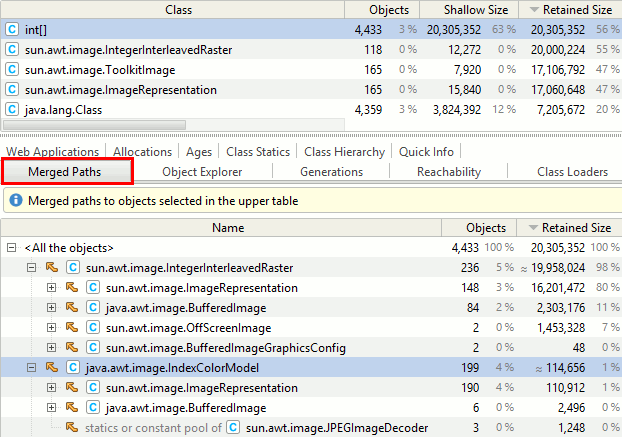 It shows that the memory held by int instances is mostly retained by IntegerInterleavedRaster instances, which are in turn retained by BufferedImage and OffScreenImage. Another difference between Merged paths and Paths from GC roots is that the merged paths are build on the dominator tree while the paths use the full object reference graph as is. This means that some intermediate nodes seen in Paths from GC roots may be missing in Merged paths for objects which are retained indirectly.